The strength of the Alpha Bracket design allows us to maximize the distance between attachments to the walls, which minimizes penetration through the insulation and air/vapor barrier. This allows Cladding Corp’s design to be the best performing system on the market and to reduce the thickness of insulation by over 50% of conventional hat/zee shapes. Cladding Corp was one of the members of the steering committee who developed the AAMA 509 Test Standard for Drained and Back Ventilated Rainscreens. Our systems are the first of its kind for North America and are designed to prevent, collect and discharge water per the guidelines of the standard. In addition, our systems are designed to limit airflow through the system, which can encourage condensation-related mold and heat loss. For high-rise and commercial construction, elements like masonry ties or threaded screws are not sufficient to support the combined dead-load, dynamic load or windload implied on the cladding materials. In these cases, structural elements are necessary to meet basic design loads. ECO Cladding's bracket-based systems for Cladding Corp products are designed to meet or exceed the requirements of ASHRAE 90.1 2010. By utilizing a system that incorporates brackets, designers minimize thermal shorts in the building envelope created by structural elements. All of these systems can be thermally modeled to prove the insulation performance of the wall. ECO Cladding systems for Cladding Corp products are easy to install. These systems allow materials to be rapidly set even when backup walls are not plumb or true. The “thumb-hold” feature of our brackets allows the system to have a +/- 3/4in adjustment without the need for external shims. And when we say “we’re all thumbs” – that’s a good thing since the slotted feature of the brackets hold the primary system profile until it can be fixed with a fastener eliminating the need for clamps or an extra set of hands to hold things in place while leveling. This feature is also perfect for existing out of tolerance walls in recladding situations. The aluminum that ECO Cladding uses is an architectural marine grade material, which provides superior performance against corrosion and outperforms lower grade metals like galvanized steel. This is especially important for open jointed systems that can allow moisture flow into the ventilated cavity The use of 6063-T6 aluminum, meets or exceeds ASTM B221, AMS 4156 and ASME SB-221 standards. And our finishes meets or exceed AAMA 2604 and AAMA 2605 specifications. 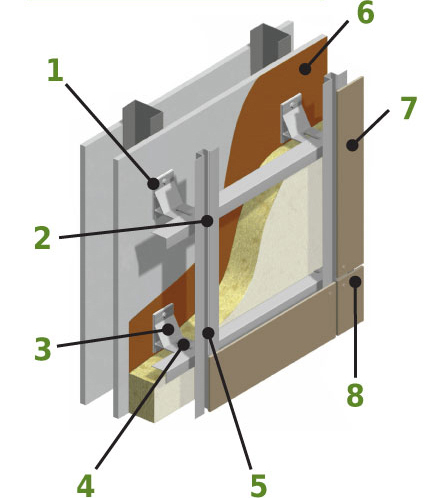 ECO Cladding's bracket-based systems for Cladding Corp products allow fewer penetrations through the Continuous Insulation (c.i) plane and into the weather protective membrane as compared to a conventional hat/zee approach using continuous profiles. Fewer penetrations mean you maximize the air weather barrier’s performance by reducing opportunities for air and water leakage. Also, our system brackets are detailed so that they create a seal between the bracket and membrane. Our systems are also detailed to incorporate rigid profiles that control both air and water transmission at the perimeter of the system and at location of penetration through the cladding. Our systems are designed to address material movements associated with thermal expansion and contraction during temperature changes. Connections at brackets, profiles and panel fasteners are detailed to limit panel stresses associated with these thermal movements. Our partners at ECO Cladding meticulously detail the locations of fixed and sliding point connections in the aluminum profiles to limit stresses associated with material movements and highlights these locations to our installer in our shop drawings to assure proper installation procedures. ECO Cladding systems give the designer the opportunity to use visible or concealed attachments. The visible systems attachment point can be emphasized as a design element either through shape or color selection or minimized by matching the color with the surface of the cladding material selected. Concealed systems allow the cladding product to attach to the sub-framing system in a hidden manner. Flat panels can be drilled on the backside using undercut anchors and attaching a concealed hanger clip.